A Black man—or is it a woman?—is fighting with a heavy length of chain. Their whole body strains against it, soaked in red light. Neck muscles pop. The chain bangs the rafters with a tinny thwack. On our subjects's body, a black velvet dress hangs down, limp as a shroud. Gregory Ligeti’s Requiem builds, swallowing space as notes climb higher and higher. And you find yourself asking: are they going to make it out of this alive? Is there any way? The scene marks the beginning of Equators, a 30-minute dance and multimedia installation from Tnmot Aztro founder Arien Wilkerson that addresses the intersection of social and environmental justice, climate change, communities of color, and the Black, queer experience. A collaboration with artist David Borawski and lighting designer Jon-Paul La Rocco, the performance ran last weekend at the University of Hartford’s Slipe Gallery. The show has been touring for the past several months; more information is available on the artist’s website. Equators starts with a disarmingly simple premise, steeped in history: climate change has been most unfair, and done its most damage, to communities of color. Social history, charging forward on a parallel and equally perilous track, has deemed members of those same communities inferior and scientifically unnatural—to the point where it is now a matter of life and death. To the point where it’s been a matter of life and death for some time. Behind that assumption are centuries of displacement—first of Native people from their land, of Black families from Connecticut’s cities, and of families of color more broadly with each new wave of immigration the state has seen. The result, Wilkerson argues through propulsive movement, is a system that remains separate and not equal at all, in which cities and suburbs are still often segregated by design. 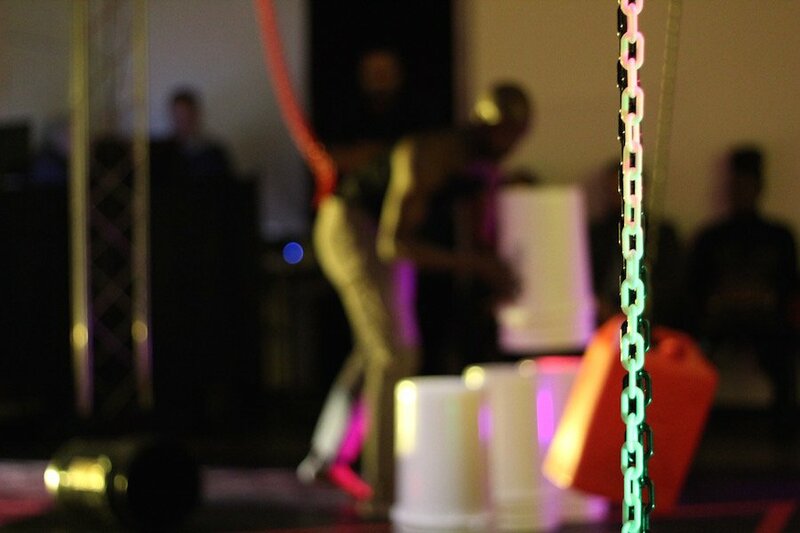 “Equators wants to engage in conversation about the embodiment of racial divides manifested in homes, neighborhoods, and geography due to impacts of zoning, segregation, and gentrification which in turn relates to environmental justice, government/municipal policies that displace, harm and continue to harm all communities specifically communities of color,” Wilkerson wrote in the program notes for the performance. In Equators, that message comes to life in bright, urgent movement, fusing environmental history, myth making and unmaking, a very queered narrative, and Wilkerson’s immense technical skill. The show’s set is spare, but packs a punch—a triangle of white plastic buckets on one side, shiny black ones on the other, separated as if by a force field. Among them, lengths of chain dangle from the ceiling, empty diesel gallons swinging at some of their ends. You know they’re meant to be moved without Wilkerson saying anything at all, because that much white and black shouldn’t be so far from each other. The result is an exquisite and unsettling performance, scored by Gregory Ligeti, William Basinski, Huerco S. Hunohuno, Death Grips, Dean Blunt and others. 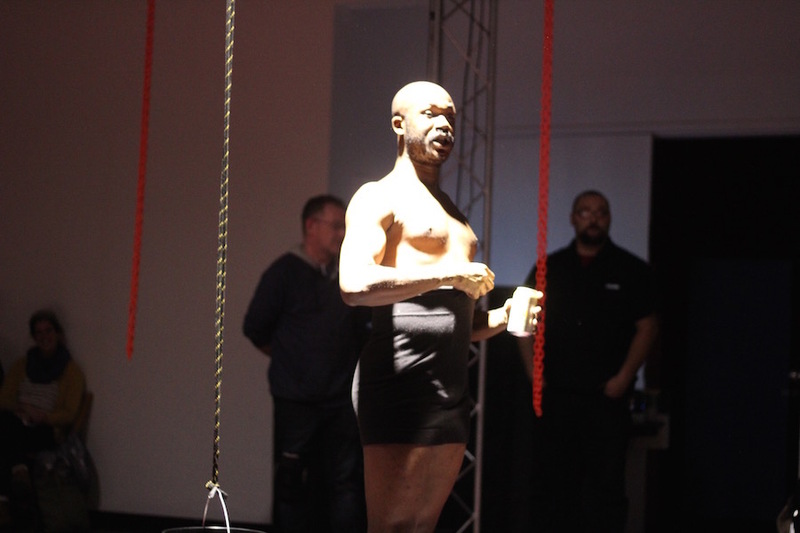 From the moment they begin moving, Wilkerson commands the space, pulling off a series of clothing changes while dancing through (and sometimes with) chains, stepping in and around projections of red and blue police lights that appear on the floor, and shape-shifting in and out of gendered and racial expectations. The show is unapologetically queer, with clothing changes that include a long, pattered day dress, light blue négligé, platform heels, and slinky, shimmering velvet. Indeed there are time when it could just as easily be called Fault Lines, for the shifting, grinding tectonic plates it dances so nimbly upon. Except that Equators stakes a specific territory: Wilkerson wants to draw that even line across the world, and then redraw it to be more equitable. The show is at its most dynamic when the dancer—and the audience—must reconcile the beauty and power of movement with the crude reality that spurred the performance itself. As balletic movement meets something that might be at a hip-hop cypher, and lyrical rubs right up against drag ball culture, we're also forced to remember toxic air quality, removal of land by redlining, slum clearance, and eminent domain, and the way poverty is penalized through environmental means, like leaded water and buses that still use diesel fuel. In one vignette, Wilkerson moves around the theater in tan pants and a black tank, shoulders squared, arms flying, legs spread. As music builds, chains, buckets and gallon cans fly out at the audience, Wilkerson in a righteous rage. But the dancer never loses control of their body. Not even for a second. Every thrust is calculated, every carriage of the arms as graceful as it is angry. It’s only scary for a moment—until we realize how much scarier it is outside the walls of the gallery. That until we stop trying to exert control over mother nature, and over bodies that are not our own, nothing will change. In another, Wilkerson shifts around the theater, their body enmeshed with the chains, the strewn buckets now rolling on the floor. Layered voices bubble up from the speakers, so thick at times it’s hard to tease out anything at all. There are snippets: text from Roland Barthes' Mythologies, U.N. Philippines Representative Yeb Saño, Jasmine Agosto's erudite words on Civil Rights in Hartford. Wilkerson is beautiful and sleek as they move. But Equators is also a celebration of resilience, sometimes unfathomable, in the face of a system that does not support it. As Wilkerson changes into a black leotard and shiny go-go boots, shafts of light appear on the floor, music shifting to something flecked with house and bookended by French cafe. Wilkerson struts across the set like it is a runway, breaking their own silence as they exclaim "ta!" triumphantly from all sides of the theater. It’s beautifully queer—they know exactly who they are, and the histories they are standing upon. They’re exactly where they're supposed to be. When they lose the leotard and continue in black underwear and boots, it feels inevitable in the best possible way. It is a pugnacious, propulsive, and totally compelling call to arms. By the final vignette, Wilkerson has rearranged the buckets several times, gathering them at the center, stacking them together, breaking them down again in rows. For one last time, they’ve moved into another new configuration. One black and one white dangle in the air, close to the chain that once held Wilkerson hostage. They waffle, pulled up and pulled down as Wilkerson yanks their weight, then lets them down again. When the dancer opens their mouth to ask a final question, we find that we almost do too. Which has more power? Which has more power? Which has more power?